Cute, eh? Excuse me for talking northern, but despite my bias against sporty, skiing type headbands, I can't seem to escape the far north. It's probably the colors and the breezy pattern that give it a Nordic look. In this case, the dropped stitches of the Diagonal Weave pattern and the alternating yarns have given the headband needed stability, so it doesn't flop around on your head, but hugs it nicely. The fact that it is only 18 inches long probably helps too. The other headbands were 20 inches, so I have learned something about negative ease from this experimental yarn testing - that is you probably can't have too much, within reason. Andean Treasure, the Knit Picks yarn sample that inspired this design, is listed as sport weight at 6 stitches to the inch. It is a very soft, heathery baby alpaca yarn in a medium blue called Summer Sky. This yarn paired nicely with RYC Cashsoft in DK weight. Cashsoft, merino wool and acrylic with a little cashmere content, is nearly as soft and can also be easily knit up at 6 stitches per inch. 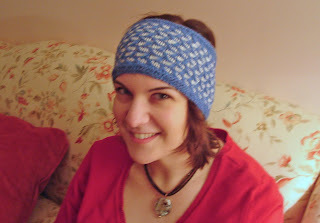 Here is the pattern for the headband that I call The Weaver. Row 1 (right side) - with color B, knit 2, *slip 1 stitch purlwise with the yarn held in back of the work, k3; repeat from *, end k1. Row 2 - with color B, purl 4, * slip 1 stitch purlwise with the yarn held in front of the work, p 3; repeat from *, end p2. Row 3 - with color A, k2, *drop slipped stitch off the needle, k2, pick up dropped stitch, place on left hand needle, and knit it; k1; repeat from *, end K1. Row 4 - with A, purl. Row 5 - with B, K6, *slip 1 with yarn in back, K3; repeat from *, end k1. Row 6 - with B, p4, *slip 1 with yarn in front, p3; repeat from *, end p3. Row 7 - with A, K4, *slip 2 with yarn in back, drop previous slipped stitch off the needle, slip the same 2 stitches back to the left hand needle, pick up dropped stitch, place on left hand needle, and knit it; K3; repeat from *, end K3. Row 8 - with A, purl. 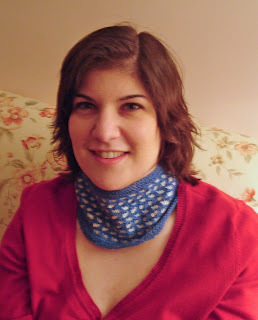 With A, cast on 103 stitches (plus 2 selvedge stitches if desired). Leave tail long enough to sew ends together later. Purl 6th row, increasing 12 stitches evenly across row - 115 stitches (plus slevedge). 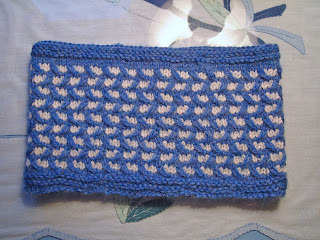 With A, Knit one row, decreasing 12 stitches evenly across row - 103 stitches (plus selvedge). Using steam, block to measurements - approximately 5" x 18". With right sides up, set both edges to be sewn next to each other. Weave together with Mattress stitch. Steam seam. That is really pretty. And I love the color -- looks like a perfect goes-with-everything shade of blue.